The concept of a leftover Easter egg is something I find hard to get to grips with. In our house, uneaten Easter eggs must have something seriously wrong with them, or have fallen down the back of the sofa. The whole point of self-denial during Lent is to celebrate your resolve with a massive blow-out at the end, which is where the Easter eggs fit in. Fit into your stomach, I mean. I do understand, however, that sometimes you can have too much of a good thing, including Easter eggs. So when Sainsbury’s asked me to come up with a delicious recipe for using up leftover Easter eggs, I immediately thought of ice cream. If you’re fed up with chocolate or feel you need to stop indulging, it can go into the freezer until such time as chocolate becomes desirable once again. 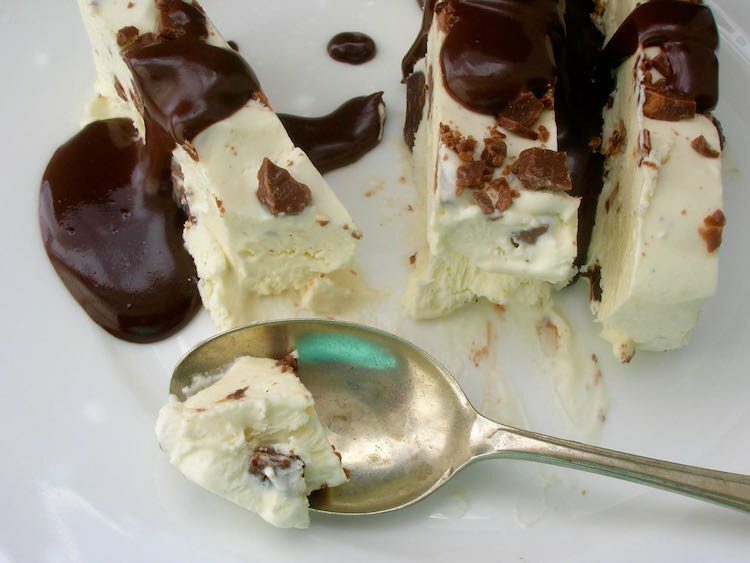 So, assuming there are such things as leftover Easter eggs in your house, here are some suggestions on how to use them in addition to the leftover Easter egg chocolate ice cream recipe given below. Melt leftover Easter egg chocolate down and use to drizzle over cakes and biscuits such as these peanut butter and chocolate cookies. Turn leftover chocolate into chocolate sauce for pouring over ice-cream or any number of other things – it keeps well in the fridge. This honeyed chocolate sauce is rather delicious. Chop all your leftover Easter eggs and chocolate into bits and use for any recipe using choc chips: cookies, flapjacks, brownies, cakes – the list could go on. Substitute choc bits for the walnuts in this brownie recipe. I may claim that there are no leftover Easter eggs in our house, but I am a hoarder and tend to squirrel things away, often forgetting about them. This post prompted me to do a little search and lo and behold, I found some mini eggs from Easter 2013 nestling at the back of a cupboard. Plain chocolate eggs filled with creme de cassis, I thought they would be an ideal addition to my ice-cream. The unfortunate crushed bunnies and one of my less successful Easter egg attempts went into the mix too. Initially I was going to flavour this no churn ice-cream with vanilla as I wanted the various tastes from the eggs to stand out. But then I remembered a bar of mint and vanilla chocolate that I used to be rather fond of. The vanilla and mint were both subtle and finely balanced and worked together surprisingly well. So in order to create my own version of this flavour combination, I decided to use some fresh mint from the garden which wouldn’t give too strong a flavour; I only used a little bit of vanilla pod for the same reason. The balance of flavours and ratio of ice-cream to chocolate was just perfect and it was not overly sweet. The hint of mint, made it quite refreshing and the light creamy ice-cream was easy to eat. Chunks of varying types and size of chocolate made each mouthful an adventure. I served it with this dark chocolate sauce with some added water to make it a better pouring consistency. 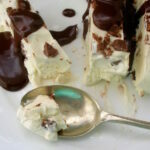 A creamy but light and not overly sweet no churn choc-chip ice-cream flavoured with vanilla and a hint of mint. Ideal for using up all those leftover bits of Easter chocolate. Serve with chocolate sauce if desired. Warm 100ml of the cream with the mint in a covered pan until nearly boiling. Turn off the heat and leave to infuse until cool. Strain the cooled cream and add it along with the rest of the cream to a large bowl. Add the condensed milk. Scrape out the seeds from the vanilla pod and add to the cream (you could use vanilla extract, or ground vanilla pod or even vanilla paste). Roughly chop the chocolate (or place in a bag and bash with a rolling pin) and add to the cream, reserving a couple of spoonfuls to scatter on top if desired. Fold into the cream. Pour the cream into a 1 litre tub and scatter over the reserved chocolate. Place in the freezer. Yields one litre plus a little bit more. Cooking with Herbs over at Lavender and Lovage is all about mint this month. Using my own fresh mint to flavour this ice-cream makes it particularly apt. I’m also submitting this to Simple and in Season with Ren Behan. Fresh mint is now in season as evinced by this use of my first picking of this year’s mint. This month’s event is being hosted by Michelle from Utterly Scrummy Food for Families. As this really is a Dead Easy Dessert and can be in the freezer in under 30 minutes, I am sending this off to Michelle of Utterly Scrummy Food for Families who is hosting this month for Sarah of Maison Cupcake. Despite it’s seeming lavishness, this is a very frugal recipe. I bought the cream at a bargain price as it was going out of date and the Easter eggs were already there and needed to be used up. I am thus sending my ice cream off to the No Waste Food Challenge normally hosted by Elizabeth’s Kitchen Diary, but this month by Ness of JibberJabberUK. Leftover Easter Egg Chocolate Ice Cream. PIN IT. I was sent a Sainsbury’s shopping voucher in exchange for developing this recipe and post. I usually still get an Easter egg from my mum, so always look forward to that, but unless I’ve hidden something away for a rainy day, CT hoovers up anything that is left “lying around”! Thank you. We’ve had such lovely weather here recently, ice cream feels sort of right. absolutely genius idea and I love the addition of the mint too… it’s like where all the bad bits of Easter eggs go to die. A fantastic idea! It looks so creamy and smooth. It has a lovely texture Angie and a lovely flavour too. That is the best looking Easter dish I have seen this year, it appeals to me much more than creme eggs in cake or bars does. Great invention. What a great way to use up leftover choc! I am like you finding chocolate (and duplo) everywhere. This looks good. Haha, glad I’m not alone Bintu. Yes, good point Dannii, something I too am wrestling with! This icecream looks amazing and so delicious. Thank you Ren – add a bit of refreshing fresh mint and suddenly it doesn’t seem quite so decedent somehow!!! You’re right Fiona, this is really a glorified choc chip ice-cream. Hi there, I love the idea of using up leftover choc in an icecream. I have some mint choc to use up and this could be interesting. Do you think it would work as a frozen yoghurt (natural yog + condensed milk) or would the yoghurt’s sourness not work with the mint? Mint chocolate sounds like a fantastic addition. Not sure if the yogurt would work as a no-churn, I’ve not tried it. Taste wise I think it could be good – think of tzatziki. If you try it, would love to know how it turns out. Oh my that looks fantastic! I would love a chunky slice of ice cream 🙂 Thanks for sending to Dead Easy Desserts! I’m just looking around my living room to see how many Easter Eggs the kids won’t notice if I appropriate one. I’m sure they would appreciate the ice cream I put them in! Thanks for linking up with this month’s No Waste Food Challenge. The perfect post Easter use up those eggs and spare double cream recipe! Exactly Urvashi – I have both again this year, so it might be time to fill the freezer.